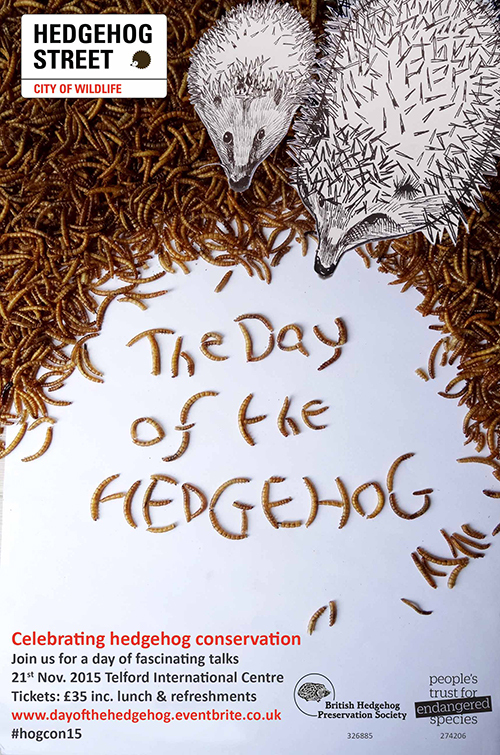 Saturday 21st November 2015 will be a very special one in the world of all things hedgehog! It is The Day of the Hedgehog! hosted by BHPS and our partners in Hedgehog Street, the Peoples Trust for Endangered Species. 400 hedgehog fans will descend upon Telford International Centre in Shropshire for a full day jam packed with fascinating talks by experts and scientists (mostly funded by BHPS & PTES) who are working on hedgehog projects. It will be a wonderful tour of the issues facing hedgehogs in 21st century Britain. There will be trade stands selling pretty much all the hedgehoggery you could think of and plenty of opportunity to mix with fellow hedgehog fans! Speakers List: Dr Pat Morris, President of BHPS, Dr Phil Baker – University of Reading, Becky Walton – Hedgehog Street Champion, Dr Richard Yarnell – University of Nottingham, Henry Johnson – Hedgehog officer for Hedgehog Street, Dr Nigel Reeve – Former Head of Ecology for Royal Parks, Carly Pettett – Researcher for WildCru at University of Oxford, Dr Simone Bullion – Senior Conservation Officer at Suffolk Wildlife Trust, Simon Thompson – Hedgehog Officer for Warwickshire Wildlife Trust, Ben Williams – Hedgehog Researcher at University of Reading and our charismatic host, ecologist and author Hugh Warwick! Tickets cost £35 each and every delegate will receive a goody bag, refreshments and a sandwich lunch. Tickets are strictly limited so please do book early to avoid disappointment. Find out more and book tickets at www.hedgehogstreet.org/pages/hogcon15.html Hope to see you there!